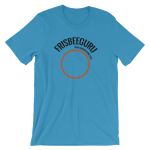 Articles about intermediate freestyle frisbee skills. In this video Matt teaches how to perform a kerfuffle. A kerfuffle is when the disc rolls around your hand on it’s rim, spinning on a third world axis. If that doesn’t make sense, the video will make it clear. To perform a kerfuffle, toss the disc up so it is perpendicular to the ground and to you. Put very little spin on it on only toss it a few inches for your hand. Now, lightly push into the rim at 3 with the side of your hand o’clock for clock or 9 o’clock for counter. The disc will pivot on it’s axis and begin to roll around your hand. Slightly lift up and then down and grab the disc as it rotates back into your hand. The Kerfuffle is a fun move that can draw alot of attention. Still, it’s not used much in most freestyle play because it’s challenging to connect it to other moves. Sometimes it’s used at the end of a series as a catch restriction…the kerfuffle itself is a restriction. Of course, of the best reason to learn a kerfuffle, as Matt points out, is that it is a “gateway trick” to learning the cuff. The hand motion and the place you touch the disc are very similar between a kerfuffle and a cuff, so learning a kerfuffle will aide in learning to cuff.